Radna with its basilica Maria Radna is an important pilgrimage place for the Catholics of Banat. It is located on the right bank of Mureș, opposite of Lipova. 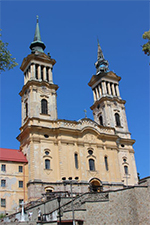 Radna is a pilgrimage place for Mary and for the days of Assumption and the birth of Mary thousands of Catholics come to the basilica. On these holidays, services in different languages are held from midnight onwards. The Catholics of Banat and their priests attend services in Hungarian, German, Romanian, Croatian, Bulgarian, Czech and Slovakian. Radna is one of many settlements in today’s Romania which contain the Slavic “ruda” meaning “iron”. The city was first documented in the 15th century. Church and Franciscan monastery suggest that the settlement was founded by Franciscans who had settled in this part of Banat. First written documents of the Miracle of Radna come from Stefan Novoselic, a Franciscan monk and the monastery’s chronicler. In 1722 he recorded light apparitions for which no one could find an explanation. 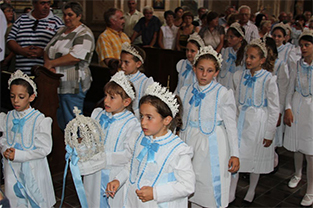 At that time, first pilgrimages and processions to Maria Radna were already taking place. The miraculous image of Mary, which is today the altarpiece, was mass-produced in Italy at the time. Today, it is the only remaining of these images. The 60 x 80 cm print shows Mary in a scapular. The first miracle is supposed to have happened in 1695 when the church burned down but the image of Mary was found unharmed in the ashes. From 1750 onwards, more and more miracles occurred. Light apparitions, healings, people being saved from mortal peril, sudden pregnancies after years of infertility and other wonders are said to have happened here. The bishop’s chair of Cenad investigated the phenomenon and declared the basilica and the image of Mary a place of pilgrimage and worship. Until 1945, thousands of believers came to Maria Radna. After that, the communists restricted the possibilities of pilgrimages to the basilica. 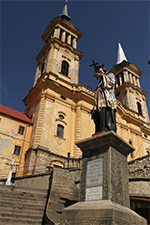 In 1948, the all orders and congregations of the Catholic Church were dissolved and the Roman-Catholic Church became a tolerated church in Romania. The tradition of pilgrimage remained though and after 1989 a new wave of Catholic pilgrimage to Maria Radna began. Before the pilgrims ascend the steps towards the basilica they pray to a statue of Mary on the foot of the stairs. RIGHT: Saint Nepomuk is Banat’s patron saint. The Habsburgs built many statues like this. Procession of girls from Radna towards the basilica. 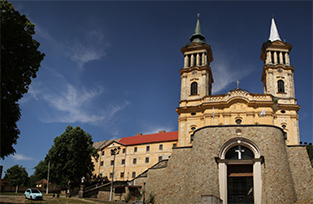 Panorama of church and monastery in Maria Radna.